Virtual reality will finally prevail at the consumer level. It will no longer be exclusively linked to gaming. It is finding its applications in the field of education, healthcare, entertainment and retail. VR webcams have overshadowed the online webcams, these webcams enable viewers to virtually transform themselves and interact with people around the world. It has upgraded the experience of video watching for the users by generating a sense of empathy like never before. It provides isolated people and communities a great power to connect with others. VR will also emerge in the medical field, providing therapy to distract patients from their pain. 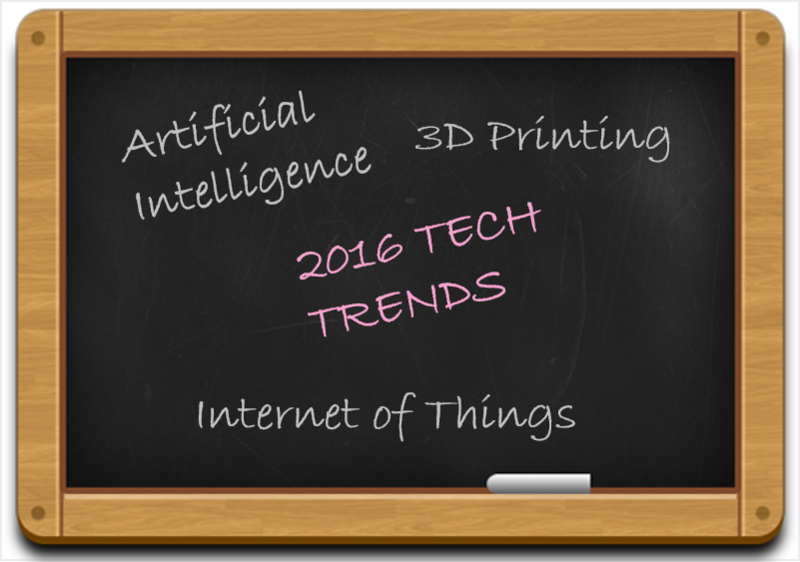 One of the top focus areas of artificial intelligence in 2016 will be deep learning. Robots will be replacing workers in the industries. Computers will be able to detect our emotions much better. There will be an increase in the accuracy of cameras, face and voice recognition. Researchers are paying a special attention in using this knowledge in education. There will be a rise in robotic toys that serve children with learning disabilities. They will be really beneficial in treating autism as they show non-human behavior, have a lot of patience and are loaded with information to answer their questions. AI will also be applied in financial services, investment banks and insurance companies will be using this technology to prevent a financial crisis before it even happens. IoT consists of computing devices in connection with the internet infrastructure. Cisco predicts that the number of connected mobile devices and smartphones will be greater than the total population of the world. Open source efforts are being made for the advancement of IoT from home appliance makers, cloud service providers, automobile developers, consumer electronics companies and others. There will be an advancement in graph databases and the techniques used for information analysis and data classification. It consists of wearables, mobile devices, home appliances, and automotive devices, all the endpoints that give people access to information or applications and enable them to connect with other people, communities and businesses. They will have their connection models expanded, resulting in a more cooperative interaction. There will be an increase in flexibility and agility of dynamic architectures. Considering the growing interest among people, the 3D printing technology is expected to gain greater advancements and find a wide-scale usage in newer industries. There will be improvements in the printing speed and new models will emerge to assemble composite components and print them. A range of smart machine implementations will emerge as a result of developments in machine learning. There will be an increase in the autonomous behavior of robots, smart advisors, autonomous cars etc. personal assistants such as Siri and Cortana will be available in more advanced versions. Newer ways will be explored to blend autonomous things into the lives of people. 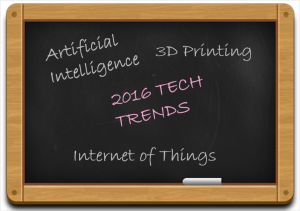 2016 certainly looks promising with these exciting tech developments.